Garage: "Garage: No Garage; Parking Space(s): 8"
Lot Size: 14161sq. ft. 119ft x 119ft "Rectangular"
Dreaming of a relaxed "get away?" 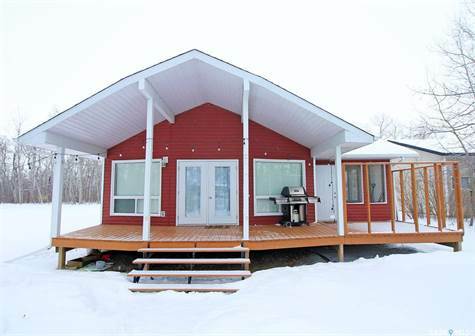 This fabulous turn-key 1100 sqft bungalow with 3 bedrooms / 1 bath is ready & waiting for YOU! Built in 2008, by Deneschuk Home Builders, in the Hamlet of Canora Beach, only 15 mins. to Canora & 40 mins to Yorkton. The living & dining room open to a West facing covered deck for easy outdoor entertaining. Plenty of cabinets in kitchen with open counter-space. All appliances are included. Enjoy the summer evenings relaxing on your South facing screened in deck. This maintenance free cottage is situated on a 120'x120' lot across the road from the lake - no water issues! Excellent drinking water - connected to Canora rural waterline, Septic tank is 1000gal. Propane furnace. Come & enjoy lake - living all year around - what more could you ask for?